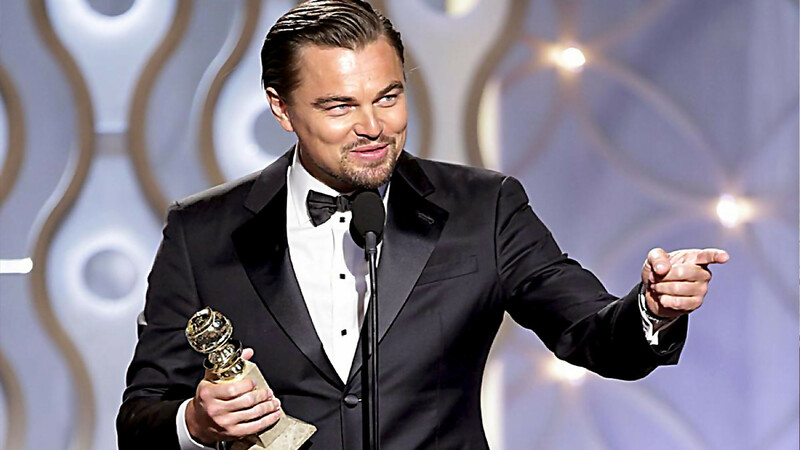 At the recent Golden Globe Awards, the immensely popular actor Leonard DiCaprio (King Leo for short) was awarded a leading actor award for his recent movie “The Revenant”, a fact based revenge tale of a man seeking retribution towards another man who killed his son, who was half native. As there were heavy elements of the North Amerikkkan native cultures in the movie since the film was set during the time of Western expansion in the 19th century, the movie took a few sparse moments to discuss the destruction of the indigenous cultures by the European at certain points of the movie. Of course, this was met with a nice round of applause from the almost exclusively white audience at this awards show since Western filmmaking, and Hollywood specifically, is entirely an anglo dominated environment. And the reason that this was such a resounding and overwhelmingly positive response is because nothing will come of it. It is beyond non-intimidating on the face of it to the status quo since there are a sparse amount of indigenous people in this country that are still alive after this most successful genocide. And because the closest these people ever get to “actual” natives is dressing up like one of them for a Halloween costume party or adorning themselves in some sports paraphernalia to support their local sports franchise that uses their likenesses as a mascot, it means nothing in any tangible way to the audience. Hence, there is no reason to fear indigenous infiltration into their exclusively white environment. Even if the entirely exclusive white spheres in Amerikkka threw open the doors and invited every living native person into their environs, the onrush would be a mere trickle of people, if even that. 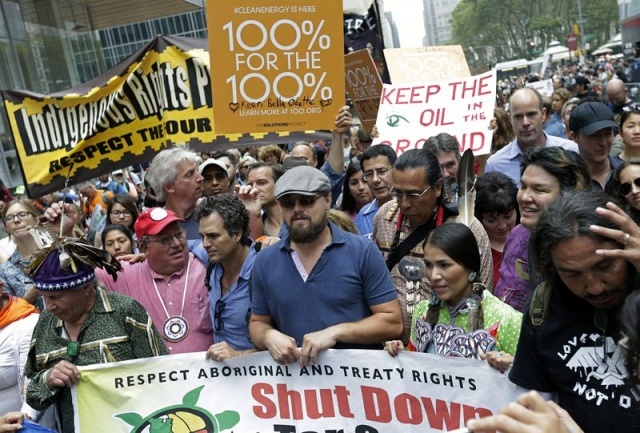 September 21, 2014, Indian Country Today Media Network: “Star Power: Leonardo DiCaprio Climate Marches With Natives, and 9 Other Celeb Sightings: While DiCaprio and Ruffalo marched alongside Indian chiefs and Idle No More organizers, the likes of United Nations Secretary-General Ban Ki-Moon strode side-by-side with former Vice President Al Gore, primatologist Jane Goodall and New York City Mayor Bill DeBlasio, among many, many others. “Brando had written a 15-page speech for Littlefeather to give at the ceremony, but when the producer met her backstage he threatened to physically remove her or have her arrested if she spoke on stage for more than 60 seconds. Her on-stage comments were therefore improvised. She then went backstage and read the entire speech to the press. In addition, the response to Littlefeather’s words by the audience was much different than one King Leo received from his assembled audience recently. The video of Littlefeather giving her speech, which can be found on youtube, shows mostly stunned silence, a few applause, but a noticeable amount of boos also. Sacheen Littlefeather refusing to accept the Best Actor Oscar on behalf of Marlon Brando for his performance in “The Godfather” – the 45th Annual Academy Awards in 1973. Liv Ullmann and Roger Moore presented the award. Since that time, there hasn’t been much mention of the treatment of natives in cinema or even in Amerikkka during Hollywood awards ceremonies or anywhere in the entertainment industry. Before King Leo’s recent speech, the only other blip at a Hollywood awards ceremony was during Kevin Costner’s acceptance speech for Best Picture in 1991 for the film “Dances With Wolves”, his grand opus about one good white man amongst the savages, where the natives were a mere backdrop like any onstage prop to showcase the white character’s overwhelming humanity. Costner threw a few words of thanks to the Sioux community, but nothing of any significance in terms of reparations or acknowledgement regarding even the present plight of the people who he exploited for artistic recognition and monetary success. It was just a perfunctory thank you for Costner’s brief appropriation of their culture for his individual aggrandizement. Nothing more and nothing less. And since it was as non-threatening as you can get, the positive response was approximately twenty years after the previous reaction, which was tepid in the most positive, unbiased description of the scene . The relaying of non-anglo pain and anguish must always be filtered through the mouth of a white representative, most preferably male.In a sign that this may actually be cyclical in nature, a little over twenty years has passed since ‘Dances With Wolves’ received awards and accolades and a fair amount of revenue for a youthful Kevin Costner. 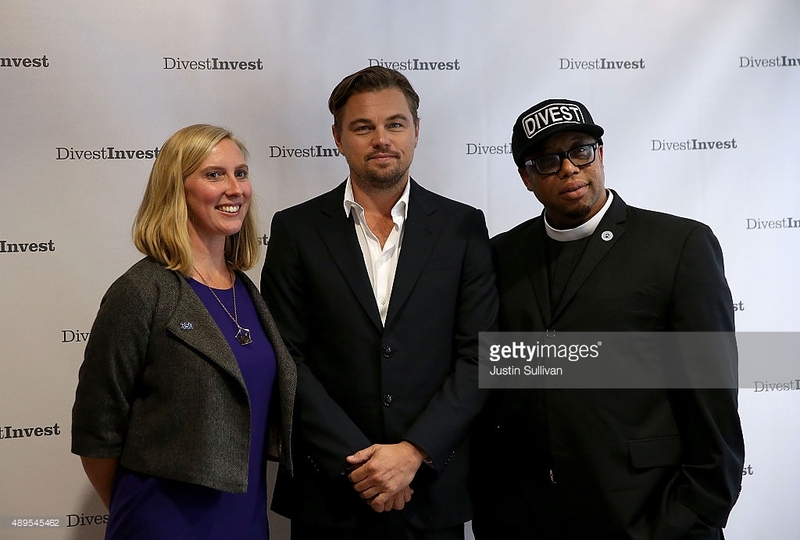 Now, King Leo is at the pinnacle of Amerikkkan Hollywood supremacy and he is the mouthpiece of what is perceived of consciousness from this particularly vacuous and superficial community. 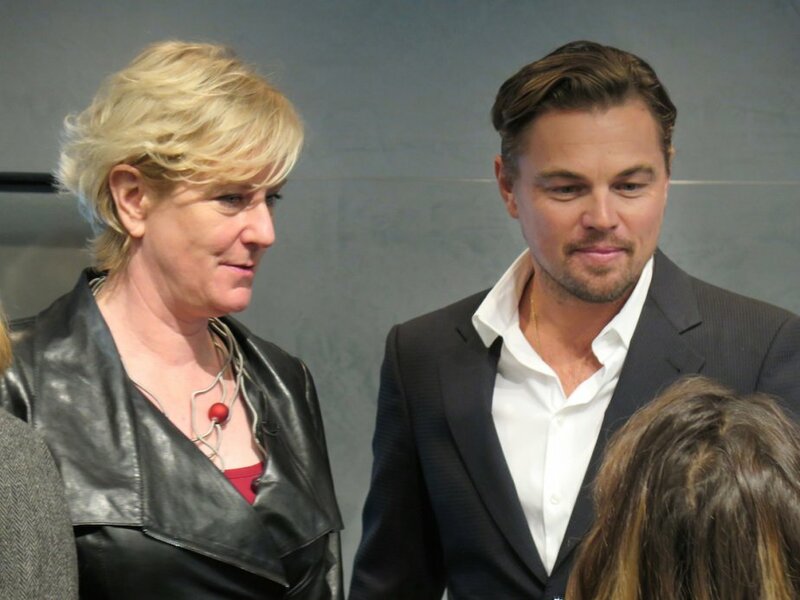 Over the past few years, King Leo has positioned himself to be seen as the social conscience of the celebrity elite. But, it is only because of this fact that the message is acceptable. It isn’t the words themselves. It is only the conduit from which they are emanating. The relaying of non-anglo pain and anguish must always be filtered through the mouth of a white representative, most preferably male. Another reason why this is so palatable to mainstream society is that it is not a threat. The only thing King Leo is calling for is just for people in general to recognize the indigenous community. Well, since the indigenous community has been totally destroyed in this country, how are these words going to physically manifest themselves in any tangible way? This isn’t calling for the sparse few indigenous to get some type or reparations or restitution, as they are housed in some of the worst conditions imaginable in this country that are equivalent to modern day concentration camps. It is just a mere call “to honor” them in some general terms and only so far as it benefits whiteness since King Leo framed it as following ‘the noble savage’ and the mystical aspects of their romanticized existence to be the salve for what is ailing the world. In an homage to the old idiom of wanting your cake and eating it too, you can evidently have the affluence represented by the congregation of the Hollywood elite and also be a spiritual messiah for all that is good in the world. The fictionalization of the world doesn’t just stop once the movie cameras stop rolling. United Nations climate change envoy DiCaprio has purchased an island in Belize to build a multimillion-dollar ecotourism resort. The 104-acre Blackadore Caye is to feature 68 guest villas, a mile of secluded beach, and infinity pools. Although prices have yet to be announced, some of the villas will be for sale at US$15 million. According to the National Post, the project will tap into the growing market for upmarket eco holidays. 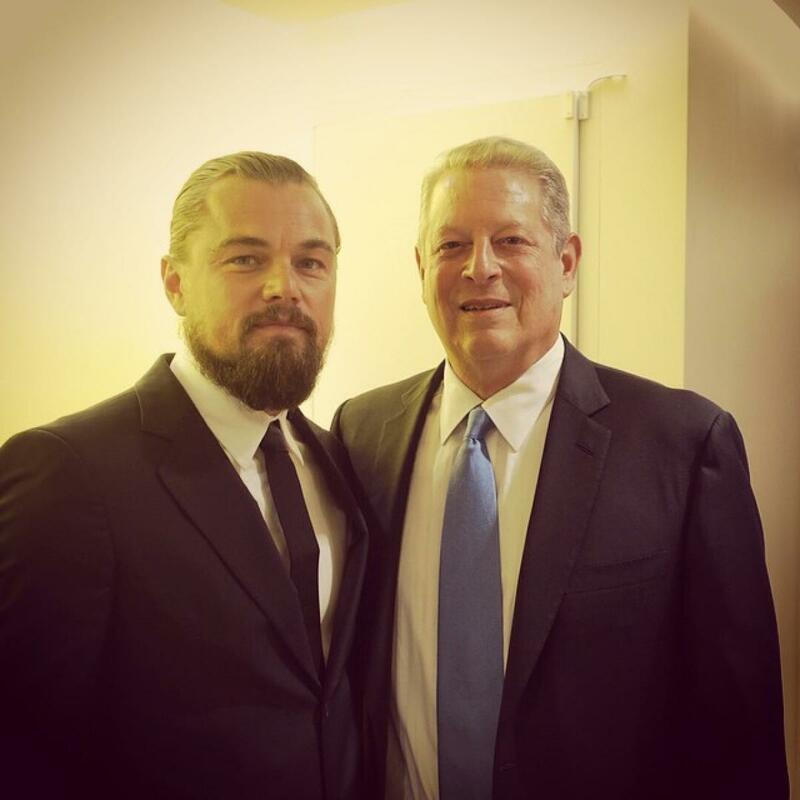 But, what does King Leo really mean by “save the Earth”? 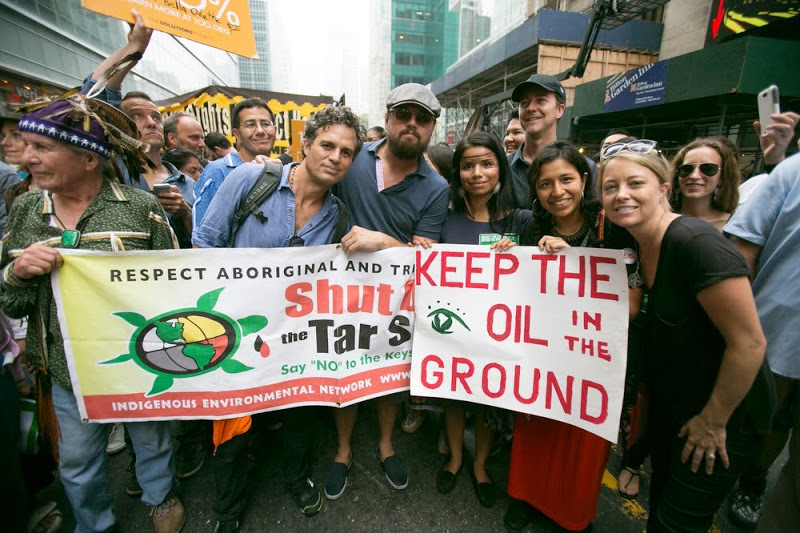 In similar fashion to how King Leo is now co-opting the global indigenous movement and attempting to be the face of the humane Western response, he has long been considered the face of the mainstream celebrity portion of environmentalism (or more honestly, its faux aspects). But, if you look at all of his work for the environmental movement, it has been nothing more than the combination of exclusivity of white privilege, the intense commercialization of all designated renewable resources (renewable in name only mind you) and the exorbitant cost of making this available those at the highest rung of the class and social order. So, when King Leo gets on this stage and says these things, he is bringing the entire cache of Western acceptability and respectability that he has been able to amass during his twenty years of success in Hollywood. This in and of itself makes him a non-threat. Yet, as the mainstream media is a byproduct of the anglo power structure, it has totally embraced King Leo’s words as the representation of the most heartfelt plea imaginable for the small, miniscule portion of Amerikkkan society that feels “sorry” for past depredations against the indigenous. 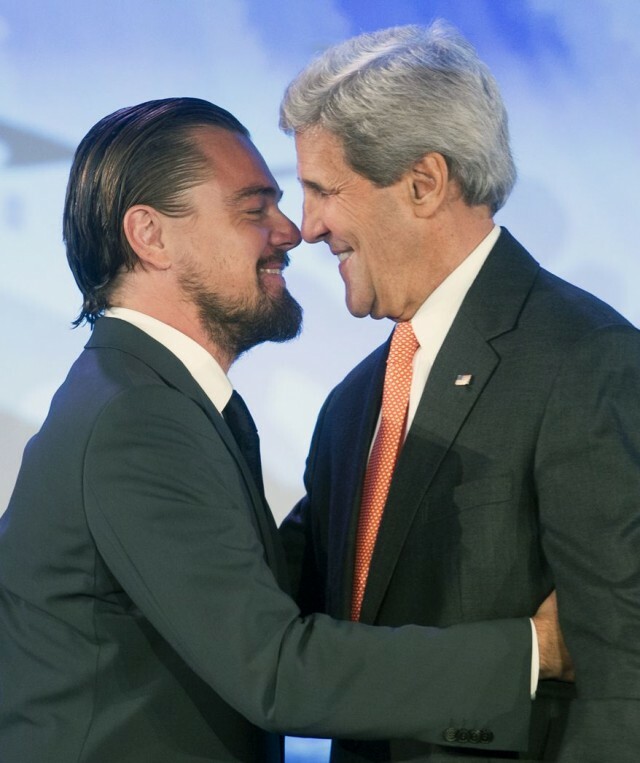 Secretary of State John Kerry (R) and Leonardo DiCapri, 2014. Therefore, King Leo will continue to receive a pat on the back from the mainstream as he is doing the job of rectifying the inequities of the past by his current statement. The fact there is no actual list of suggested solutions regarding the past and current oppression of natives is the cause of the ovation shown by the crowd at the Golden Globe Awards and the praise by the members of the liberal side of the media. However, King Leo ever endorsing something that would actually benefit the indigenous here in Amerikkka would cause a much different response. Therefore, if King Leo was to list the actual policy changes that would assist the indigenous and, by extension, affect the privilege of his audience, the applause would inexorably transition from applause to the boos of yesteryear. Edited with Cory Morningstar, Wrong Kind of Green Collective. The thirteen-year lawsuit by Native American plaintiffs (led by Blackfeet warrior Elouise Cobell) against the U.S. Department of Interior — settled in December 2009 — was hailed by the Obama administration as the beginning of a new era.The stolen royalties from the plaintiffs’ 56 million acres, administered by Interior under the Indian Trust Fund, was proven in federal court to have involved collusion between Interior and oil and gas companies to defraud Indian tribes. The willingness of the tribes to settle for $1.4 billion of the $47 billion stolen by the U.S. government since 1887, noted Cobell, reflects the desperate poverty of the plaintiffs as a class, as well as the realization that it’s probably the best they could do given the American political system.